Work on the new Alfred Street cycleway continues apace. DRD are monitoring the situation. Even if the remaining wands are placed drivers can simply drive into the Cycleway at any of the conveniently placed access points for alleys, loading bays, car parks and side streets. 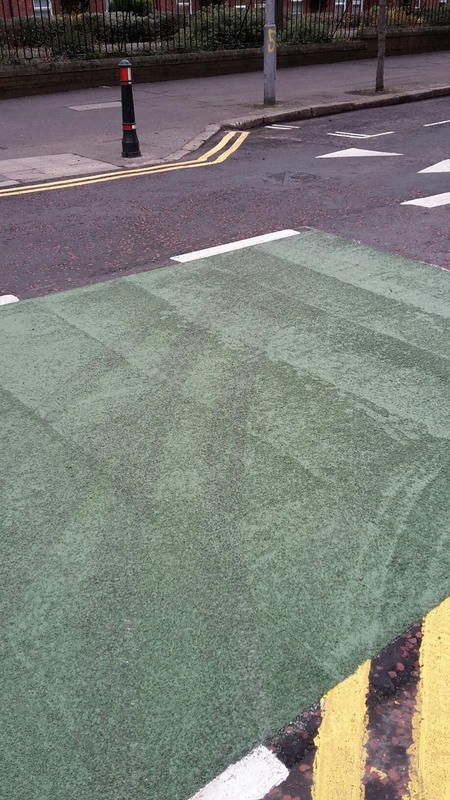 Another consequence of using fewer wands than planned is the lack of protection at junctions. The Cyclesaurus is dead. It is replaced with a broad green track across the junction. However, at present, only paint separates cars and cyclists. 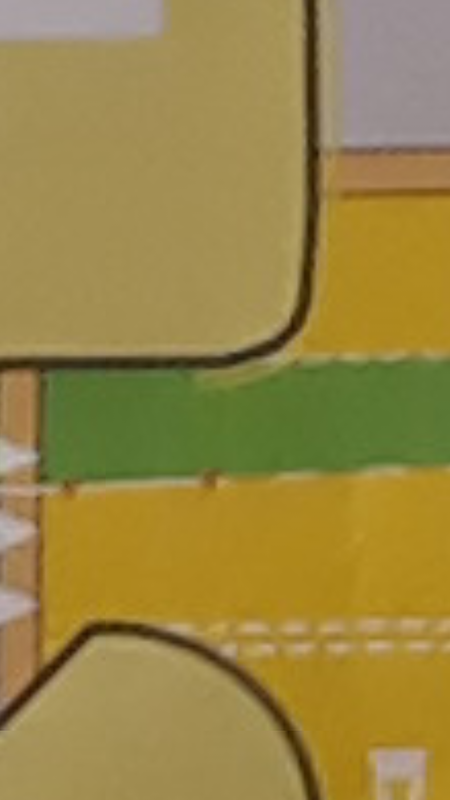 The red dots mark where wands should have been placed. The separating white line extends up to the raised junction with two wands on the raised section of the road. The line now stops at the incline with the final wand some way before the junction. According to the plans the final wand should have been roughly where this pedestrian is crossing. What the picture also shows are the tyre tracks of cars turning into Franklin Street. The lack of wands gives the corner a wide radius, so drivers need not slow down as they turn across the cycleway. This is not safe. At the Ormeau Road end the junction is simply terrible. Southbound cyclists are positioned to the right of Alfred Street. 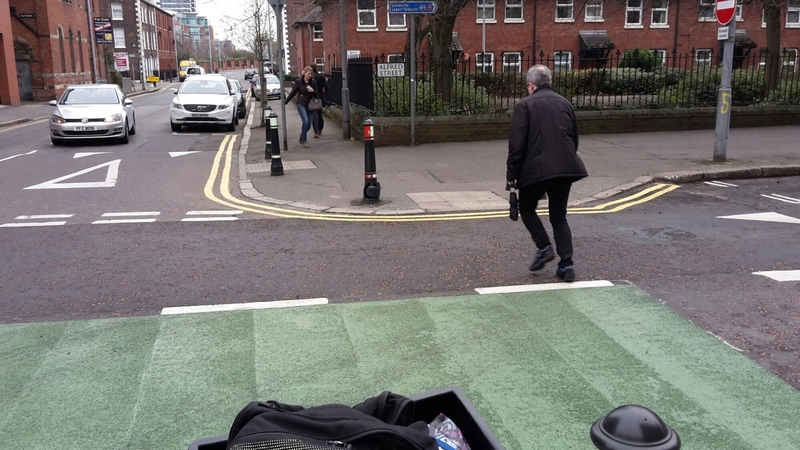 Car drivers coming off eastbound Ormeau Avenue turn in and pass to the left of the cyclist. I called it a “fudge” at the consultation event in May 2015. It is worse than a fudge. It is dangerous. 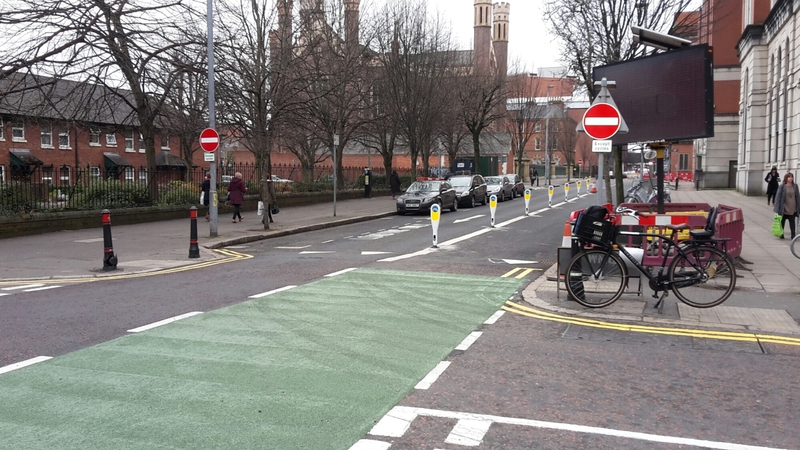 Practically, it is impossible for cyclists to turn right on to Ormeau Avenue. The design of the cycleway should have included some means of crossing safely. Again, the wide radius of the corner gives the driver no incentive to slow down. The driver will be disconcerted to see cyclists emerging onto the shared space section of the junction. I understood that the Ormeau Avenue entry was meant to be a continuous footway. This Alfred Street track is still being built. I hope enough time remains to fix the errors and increase the track’s safety. This plan is meant to set a new standard for cycleways across Northern Ireland. It does already, despite serious shortcomings. It needs to be better. 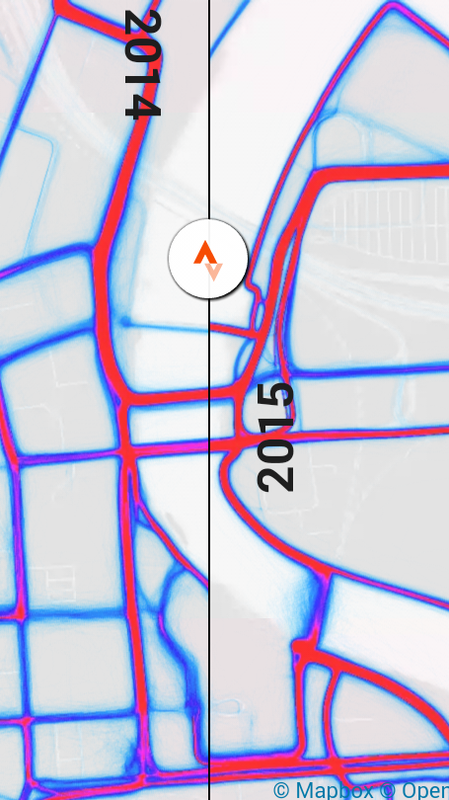 Strava Labs have released a tool to compare the heat maps of 2014 and 2015. You will all respond saying how unrepresentative it is of utility cycling and the gender imbalance and all that. Also, Strava could have become more popular. All true, but it throws up interesting stuff anyhow. I’ve looked at central Belfast. The new bridge at the Lagan Weir is many more times popular than the old bridge, without it affecting cycling levels on the nearby Queen’s and Queen Elizabeth II bridges. Also noticeable is the detour needed to avoid the works to add the oversized ugly shipping container to the side of the previously iconic Waterfront Hall. The majority of NCN9 users have chosen not to cross the Lagan at the railway bridge, though there is considerably more cycling traffic between Queen’s Bridge and the railway bridge, than between the latter and the Albert Bridge. Cycling levels have increased across the City Centre. Again, the right side of the picture is 2015. Especially at Franklin St in the Linen Quarter the number of cyclists has increased. 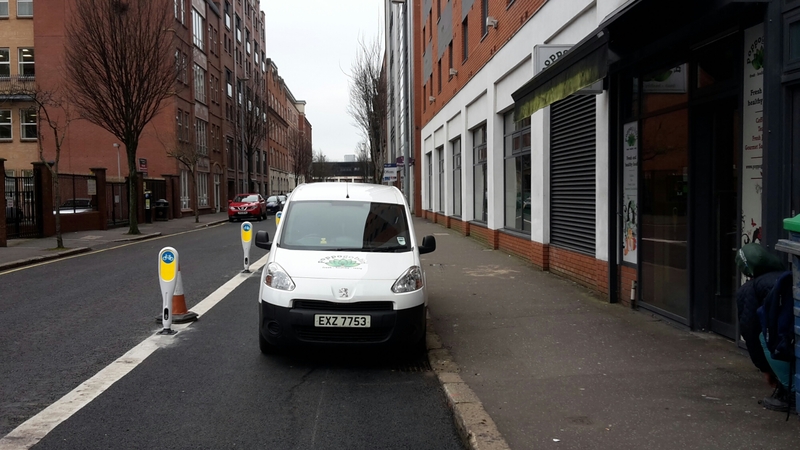 Any attempts to reduce cars travelling through the Linen Quarter should not impede this flow of cyclists. Filtered permeability and allowing two way cycling on one way streets must be considered. The BBNP path from Grosvenor Road to Bridge End will pass through High Street. Cycling levels there remain well behind those on Chichester St and May St. My main criticism of the BBNP is that it is not where cyclists are. The hope remains that, as with the new Weir Bridge, the new infrastructure will increase cycling overall, without displacing traffic from Chichester St. In the absence of cycleways in the City Centre, bus lanes act as a poor substitute. The implementation of bus lane restrictions was met with loud wailing and gnashing of teeth by car drivers. But not by cyclists. 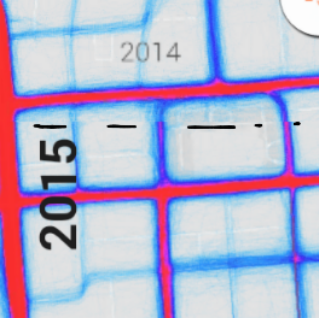 A similar increase is seen in Queen Street. 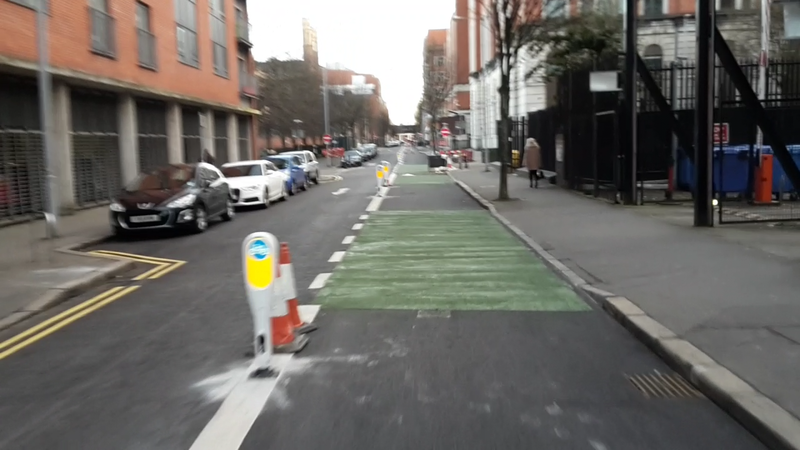 Are bus lanes encouraging more cyclists into the city centre? It appears so: the before and after surveys for BotM show a decreasing number of cars, but more pedestrians and cyclists, with overall visitor numbers increasing. The Belfast Bikes dock at Donegall Square may well be driving the increase near City Hall, which means people are logging their hire bike journeys on Strava. Surely not?! Was it not an app for MAMILs to boast about their 100 mile rides around the countryside? This gives more encouragement to the idea to close off this road to HGV, but ideally close off the rat run altogether. Across Belfast more journeys are being recorded by cyclists. Even in the west of the city. 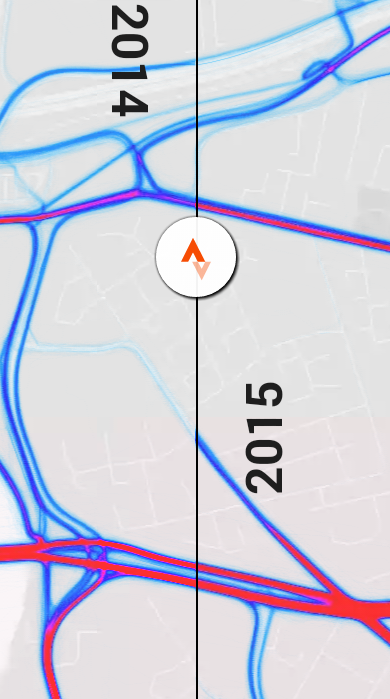 This could point to an increase in popularity of Strava, but also to a year on year increase in cycling levels. Ferry, you ask? Wasn’t it a bridge? The Gasworks Bridge planning proposal was given approval at Belfast City Council’s Planning Committee meeting. It passed despite councillors turning a bridge between a business park and a public park into sectarian issue; a point of potential conflict between office desks and trees, perhaps? Only in Northern Ireland. More worryingly, the bridge still lacks funding. If there was a demonstrable need it would be easier to argue for an allocation of £7m-9m for construction. But there are no swimmers across the Lagan. Sure why do we need a Gasworks bridge @StripyMoggie @belfastcc no-one swims across, so there's clearly no demand. I’ve been reading Rotterdam City Council’s Cycling Plan (pdf). It makes interesting reading. Here’s a Dutch city with a less than average modal share for cycling (23%). It identifies numerous issues that need to be addressed to make cycling more attractive. Rotterdam is bisected by the Nieuwe Maas. It is spanned by iconic bridges, of which the Erasmus bridge is probably the best known internationally. The main railway link to southern Netherlands, Belgium and France burrows deep under the city and river, and a road tunnel with adjacent cycling tunnel is slightly to the west of the centre. The Nieuwe Maas is wide and carries sea going shipping, with coastal trade towards Germany, but also newly built and repaired ships coming from shipyards upstream from Rotterdam. Bridges have to accommodate large vessels passing through. Severance between the north and south of Rotterdam is one of the reasons for the relatively poor uptake of cycling. People will sooner drive across into the city centre, than take the bike across exposed bridges. In contrast to other major Dutch cities a high percentage of car journeys are less than 7km. 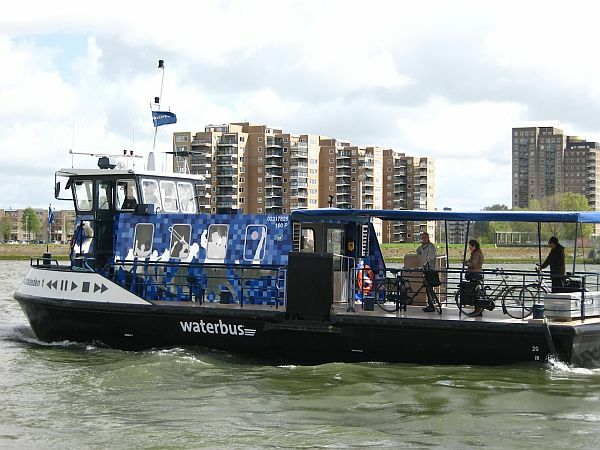 One way Rotterdam is addressing the severance is a foot and cycle ferry from Feijenoord to Kralingen, just east of the city centre. It cuts short lengthy detours to the large bridges further west or east. The service is highly rated by its users; around 120 passengers use it daily. Belfast’s proposed Gasworks Bridge across the Lagan lies almost equidistant between the Albert Bridge and the Ormeau Bridge. From one proposed bridge head to the other via the existing bridges is 2.2 or 2.0km, respectively. Belfast City Centre lacks green space, but its nearest green space, Ormeau Park, is not accessible directly from the centre, because of the Lagan. 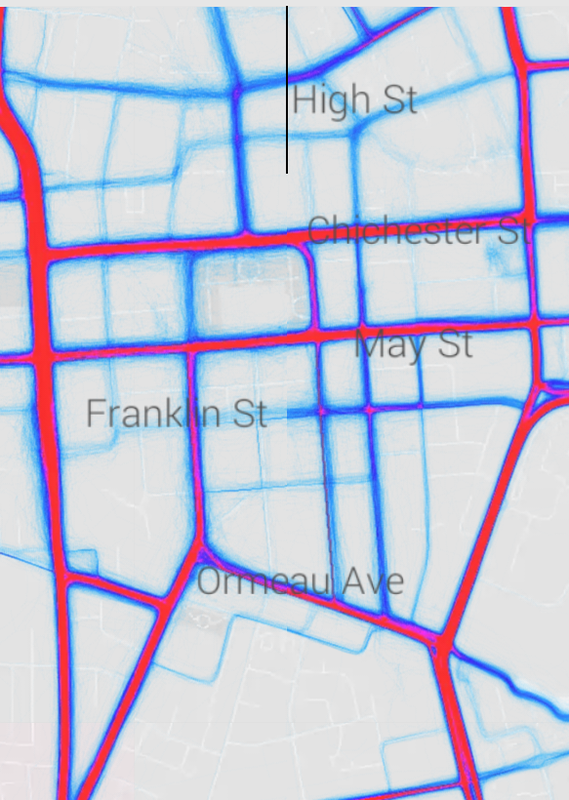 The areas with the highest modal share for cycling in Belfast lie immediately beyond the park. The Gasworks Bridge is the obvious solution to unlock the potential of Ormeau Park and provide access to the City Centre for cyclists and pedestrians from the areas beyond the Park. 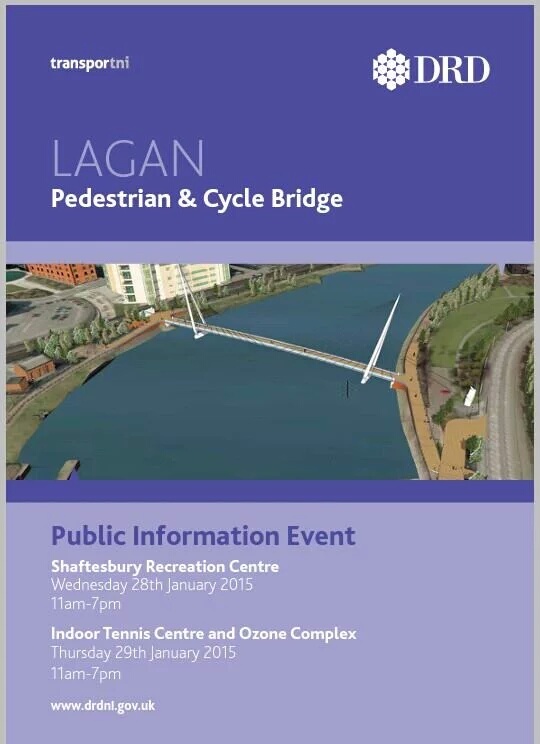 Neither the Albert Bridge or Ormeau Bridge are particularly well suited to cycling. There is no space allocated to cycling on either bridge. 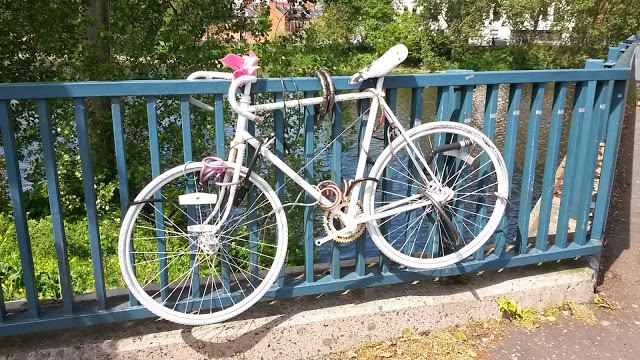 Worse, one of Belfast’s ghost bikes is chained to the Ormeau Bridge railings. Could a ferry ply back and forth across the Lagan? 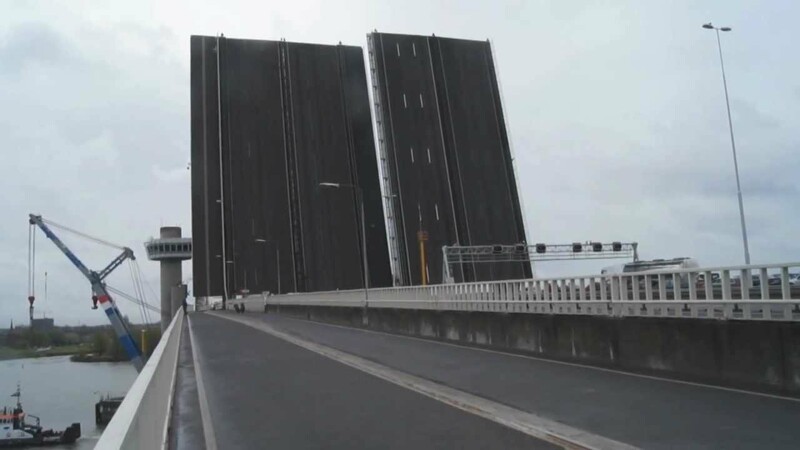 It could help start developing a cross-river network of cycleways; it could be used to gauge and stimulate demand for the bridge. Our ferry wouldn’t need to be as big as the one in Rotterdam; the Lagan is a placid pond compared to heavily used and very wide Nieuwe Maas. A ferry would only need operate during times the gates under the railway bridge at the Gasworks site are open. However, the opening times should be extended into the evening to enable better cyclists and pedestrian access. And, what will definitely appease the councillors representing communities either side of the river: a boat is crewed and therefore unlikely to become a focus for inter-community strife. @StripyMoggie – cool idea! Thanks for sharing with us. Probably one for @dsdni_gov too, as they look after crossings/moorings on the Lagan.